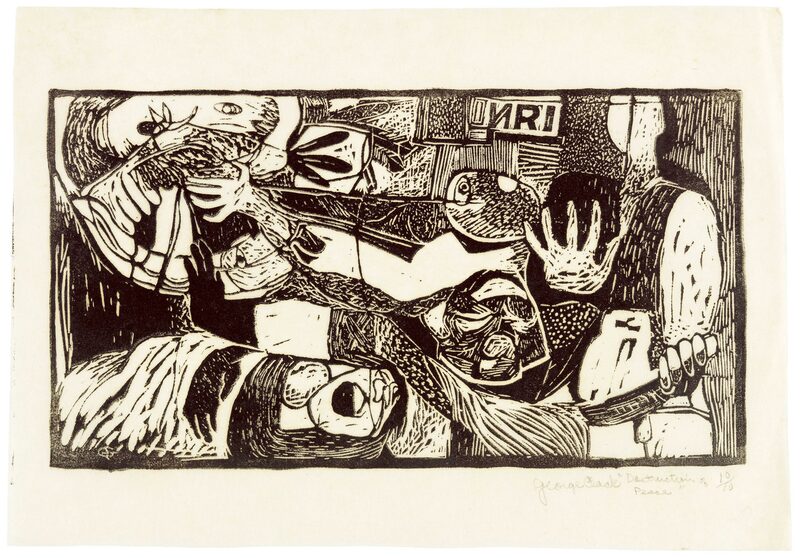 Destruction of Peace is a woodcut with a highly chaotic abstract composition, with mouths and hands the prevalent motifs. George Clack was part of the Los Angeles art scene and exhibited alongside many artists in Now Dig This! at the first Watts Summer Festival in 1966. A graduate of Chouinard Art Institute, Clack also participated in the LA Art-on-Billboards Project in 1972, and was a member of the Black Artist Association. "Destruction of Peace." Now Dig This! Art in Black Los Angeles, 1960–1980 Digital Archive. Los Angeles: Hammer Museum, 2016. https://hammer.ucla.edu/now-dig-this/art/destruction-of-peace.